The debt situation in Italy in weighing on EUR and today eyes will be on ECB Non-Monetary Policy Meeting and The US MBA mortgage applications. 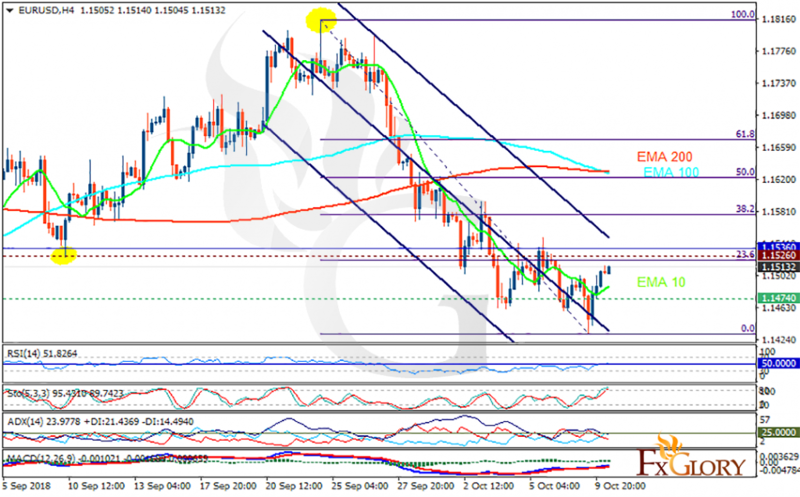 The support rests at 1.14740 with resistance at 1.15260 which both lines are below the weekly pivot point at 1.15360. The EMA of 10 is moving with bullish bias in the descendant channel and it is below the EMA of 200 and the EMA of 100. The RSI is rising towards the 50 level, the Stochastic is moving in high ranges and the MACD line is above the signal line in the positive territory. The ADX is showing weak buy signal. The resistance level breakout can be a bullish signal for the correction pattern which may push the price up towards the 61.8 level of Fibonacci at 1.167; otherwise, the downtrend will continue towards 1.14.